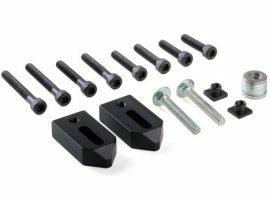 This set is an upgraded version of the P/N 3012 hold-down set that is both easier to use and holds a larger range of part sizes. 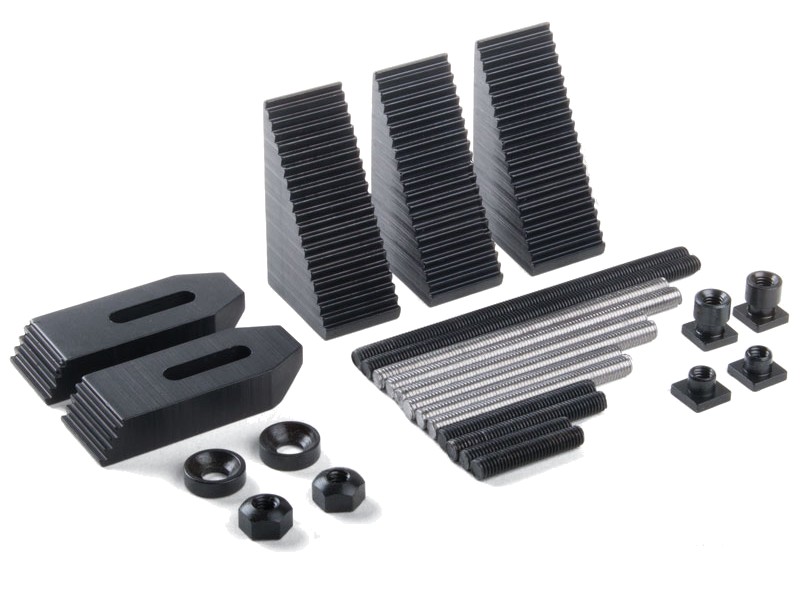 This style clamp set has long been popular on full-size milling machines, and we now produce a nice set suitable for miniature machine tools. The step blocks are notched as are the back of the clamps to make it quick and easy to set your clamps to the proper height. A selection of threaded studs from 1″ to 3-1/2″ is provided to allow a variety of heights to be selected quickly. The nut and washer design is a nice touch too. The bottom of the nut is convex while the top of the washer has a matching concave surface. Even if the clamp isn’t level, the washer will sit flat on top of it while applying even pressure. At least one set of hold-down clamps should be considered a necessity for every milling machine owner. 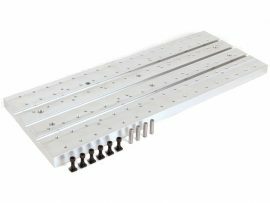 The maximum height of part that can be clamped with the screws provided is about 3″ (76 mm). 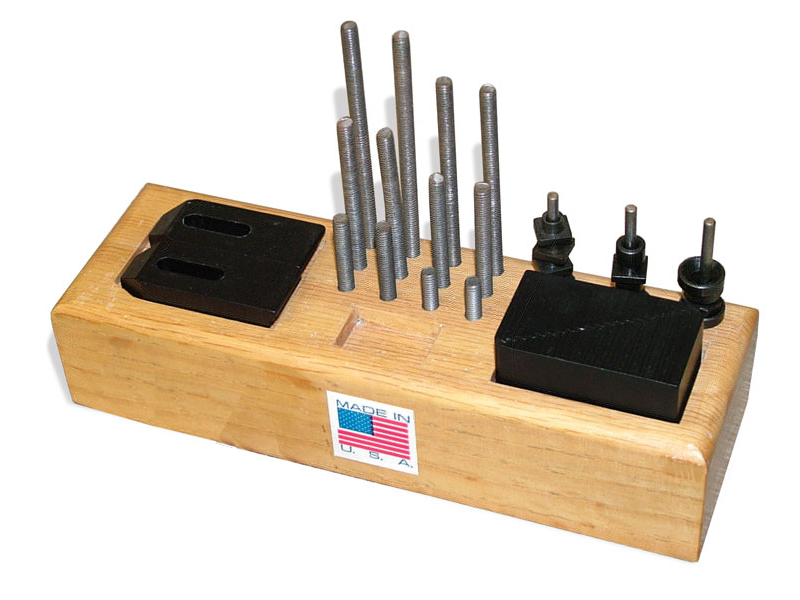 Step Block Hold-Down Set organizer block—FREE PLANS! 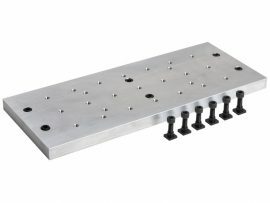 The step block hold-down set consists of many small clamps, studs, washers, and T-nuts. To keep them all organized at our trade show booth, we designed an oak block with fitted compartments and holes for each part. It looks good and keeps everything organized and in one place. Our organizer is made from oak, but you could just as easily machine it from aluminum, plastic, or whatever you like to work with and have on hand. If you’d like a copy of Craig Libuse’s plans to make this block, a simple afternoon project on a Sherline mill, download a copy of the diagram in PDF format. 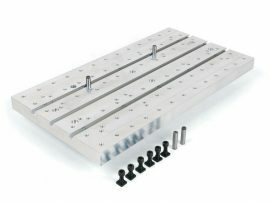 Mill Tooling Plate (7" X 18" X 3/4") This tooling plate was designed for the 5800 mill, only.